The bar scene at ArmadilloCon: Not quite as odd as the bar scene in "Star Wars," but still full of strange characters. Among them (left to right), SF Signal's John DeNardo, author Joe McKinney, Adventures in SciFi Publishing's Brent Bowen, and author/scholar Matt Cardin. 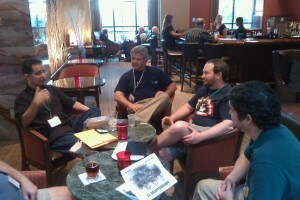 I attended my first ArmadilloCon three years ago, after decades of staying clear of the SF convention circuit. My memories of cons past were of people in badly fitting Star Trek costumes haggling over toys and packing into hotel rooms to watch sixth-generation copies of anime shows. If that’s also your memory of SF cons, listen up: ArmadilloCon is not that. Not by a long shot. It’s a con for writers, aspiring writers and people who love SF, fantasy and horror literature and art. Sure, there are a handful of people walking around in steampunk duds and few toys on sale in the dealer’s room, but mostly it’s about the books. ArmadilloCon 32 was last weekend, and I spent a good portion of it hanging with author and Missions contributor Joe McKinney, podcaster and whisky expert Brent Bowen and the brilliant horror scholar and writer Matt Cardin (who also records eerily beautiful music, it turns out). The three of us put down unhealthy amounts of booze and spent quite a bit of time talking about our favorite obscure horror films. I also enjoyed hooking up with old friends Nicole Duson, an up-and-coming Austin writer, and John DeNardo of the brilliant SF Signal website. This was the first year I participated in panel discussions, and they turned out to be a blast. During a panel on the New Weird, Neal Barrett Jr. and I agreed that there probably isn’t a New Weird, per se, since many writers — including Neal — have been weird for a long, long time. I also enjoyed my panel on the challenge of writing short stories, where I ended up between luminary authors Michael Bishop and Howard Waldrop (how the hell did I end up so lucky?). Finally, I ended up on a panel about H.P. Lovecraft’s enduring legacy with Matt Cardin and Don Webb, who displayed amazing knowledge of the author’s work. The always witty Joe R. Lansdale made a great case (and one I agreed with) that horror authors can learn far more from writers like Ray Bradbury, Robert Bloch and Flannery O’Connor. Between all the panelizing, socializing and drinking, I managed to fit in a few readings. Stina Leicht read from her upcoming novel, which mixes Celtic mythology and the complicated politics of Northern Ireland. Can’t wait for that one to hit the stands. Joe McKinney’s Sunday afternoon reading of his story “Survivors” proved a great capper to the con. The first issue of Amazing Stories is just one of the items in Texas A&M's speculative fiction collection. Ever heard of the 1975 novel “Doomsday Clock,” published in San Antonio with an actual fuse sticking out of its cover? What about “Overshoot,” a 1998 Ace paperback about an elderly Alamo City woman reflecting on how global warming brought down civilization? Or the Asimov’s story “One Night in Mulberry Court,” in which a blue-skinned alien anthropologist moves into a San Antonio trailer park? Don’t feel bad. Until a couple days ago, I hadn’t either. I discovered their existence virtually via the online site for Texas A&M’s Science Fiction and Fantasy Research Collection. Seems the Aggies have amassed a 54,000-piece collection of speculative fiction plus related history and criticism, much of it Texas-related. The collection houses the papers and manuscripts of Chad Oliver, Michael Moorcock and George R. R. Martin. What’s more, it contains over 90 percent of the American science fiction pulp magazines published prior to 1980, including the 1923 debut issue of Weird Tales. Perhaps even cooler, it’s all searchable by author, title, imprint, and subject terms via an online database. 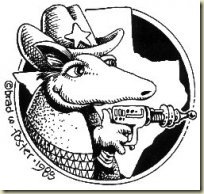 As an added perk, the A&M site also includes Bill Page’s 1991 essay “Horny Toads and Ugly Chickens: A Bibliography on Texas in Speculative Fiction,” which draws the “Ugly Chickens” part of its title from Austin writer Howard Waldrop’s wildly imaginative short story of the same name. The essay gives an exhaustive listing of Texas sf/fantasy/horror authors, both known (Robert E. Howard and Joe R. Lansdale) and not-so-known (Leonard M. Sanders and Joan Johnston), and a list of stories and books by non-Texans set in the Lone Star State. Bummer it’s almost 20 years old, though. And while you’re there, you might as well peruse other features, including extensive bibliographies of Robert Heinlein, Judith Merril and Sam Moskowitz. All told, the A&M site is an impressive resource for those of us who just can’t get enough Lone Star lore in our speculative fiction.